→ Cruiz'in the Sega Gopher - March 2017 - Jaguar Bubsy Music now playable on Genesis! Cruiz'in the Sega Gopher - March 2017 - Jaguar Bubsy Music now playable on Genesis! Hey Bubsy fans! Have you ever wanted to play Bubsy Bobcat: Fractured Furry Tales from the Atari Jaguar on the Sega Genesis? But today you can play all the mod music from that Jaguar game on your Sega Genesis, or in this case the Sega Gopher or whatever you call that Sega handheld system that Atgames sells. File is attached, (Called "Game.zip") along with all the best versions of Bubsy to play on the Genesis and a few modified games with Bubsy in it. And as a added bonus: The MDB.DAT (also attached but also in the "Game.zip" file) or menu was updated in this game directory to show pictures of Bubsy as you select games. Yep, all that hard work and research that I did for the Atari Flashback Portable, which come to find out disabled the MDB.DAT support, came in handy for this Sega Gopher directory. 1) Find a way to slow mods down. What you will hear on the "BubsyFFTx.bin" files is the NTSC version that actually sounded the best by at 5/6th the speed. The Pal version was at the right speed but sounded horrible on the Sega Gopher. But if I slow the mods down to compensate then the music will be closer to regular speed. 3) And finally I might just make more picture modifications so you can scroll through and see many pictures of Bubsy at the menu level. Ultimately, thanks to Oerg866 and Nineko for hacking Toy Story on the Sega Genesis and finding a modplayer embedded in a Genesis game. 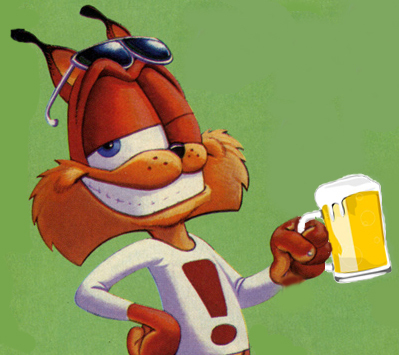 It was exciting to hear the Jaguar Bubsy music tracks on the Genesis for the first time. You have to modify images to 120x112 with less than 63 colors. Have fun! You're a flippin' wizard. Are you going to mod other games so they sound OK on the Gopher? Thanks! I'm mostly about the Bobcat and I just tinker with things to get the best result. I'll say aside from working with various versions and utilities I'm not much of a hacker/programmer/decompiler though I do dabble. One thing that has thinking this morning morning is the .vgm is a stripped down .wav file if I understand it correctly. Plays great even on the Sega Gopher. Why not make a .vgm of the super nintendo version of Bubsy (which was superior) and play for the background tracks? I am just amazed at what .vgm's are and how well the Genesis can play them. How hard would be to port JagBubsy to Genesis, given usage of one of Genesis Bubsy games as a base (so you won't need to rewrite engine and you'd just be porting graphics/levels)? Hey Darkhog! Ok, here is what I know so far. The game engine for Jaguar Bubsy is already based on the Sega Genesis code. So many similarities there. I have decompiled or collected from places most of the code and graphics. If you are able to use the modplayer taken from Toy Story, then the mods (music) files are available. The backdrops are in .cry or other formats used on the Jaguar. Those could be converted. What I am just starting to understand are the formats used for the Bubsy FFT characters. Also just starting to understand the map setup. I know that the Genesis uses a tile system. The map editor for FFT also used a type of tile format in a map editor But just barely starting to understand that. So anyway, all things are possible if you throw enough time at it. We'll probably have Bubsy FFT ported to the Genesis by 2030 at this rate. Cruizin' Change.org - Petition: Bubsy in Smash Brothers roster! Cruizin Facebook - October 2018 0 Michael Berlyn's Birthday!